Hi, thanks for your comment on my blog. I'm now following you. And LOve Kaffee Klatches. My mother use to have them once a week at our house. I learned a lot as a kid sneaking listening to what the ladies gossiped about. yum...coffee. I live in Portugal where coffee is a religion. There are nineteen billion different types (I know, I'm prone to exaggerate, but it's A LOT) and, if you're new to the country you need to take several weeks getting to know which one is right for you. I think the Portuguese coffee is so mellow - it's not bitter - because it's a blend of African with Brazilian beans. Yum...where's my coffee? I'm not a big coffee drinker, but I love to smell it. At the grocery store, people think I'm a coffee junkie! Just gotta smell!!! But I will drink a little if I'm meeting someone over coffee during business hours. 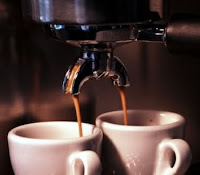 you can't blog too much about coffee!